As you may know, the title of our WEASELS anthology comes from a bizarre tale about killer weasels published in the September 1956 issue of MAN’S LIFE. 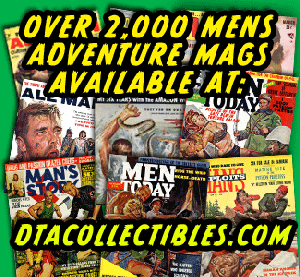 It’s one of the 22 classic men’s adventure stories included in the book. 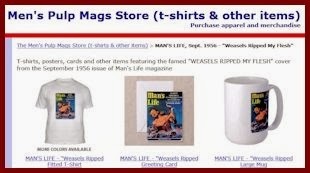 Thanks to musician Frank Zappa, “Weasels Ripped My Flesh!” is the most famous line ever written for a men’s adventure magazine. Zappa borrowed it for the title of a Mothers of Invention album in 1970 — though he used a painting by artist Neon Park for the LP’s cover instead of the cover painting artist Wilbur “Wil” Hulsey created for the MAN’S LIFE story. I have a special fondness for the killer creature artwork and stories published by men’s pulp magazines. And, there are hundreds of examples. Some feature animals that truly are dangerous, like lions, bears, poisonous snakes and crocodiles. As many or more involve highly unlikely “killers,” including anteaters, beetles, crabs, flying squirrels, foxes, honey badgers, lemmings, lizards, manta rays, minks, newts, otters, salamanders and weasels. A third subgenre features stories and artwork in which Nazis, “Commies” (usually Chinese, Korean or Vietnamese Communists), Arabs, American Indians or tribal “natives” of various countries used animals to torment scantily-clad damsels or hapless male captives. 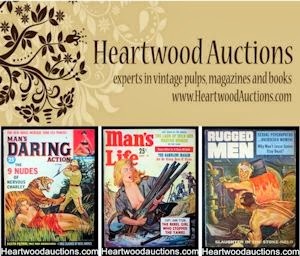 In the realm of vintage periodicals, this torture-by-critter subgenre is virtually unique to men’s pulp adventure magazines. 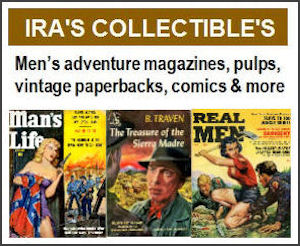 As shown here, examples can found in many different men’s pulp mags, including ACTION FOR MEN, ALL MAN, CHAMPION FOR MEN, FOR MEN ONLY, MAN’S ACTION, MAN’S BOOK, MAN’S DARING, MAN’S EXPLOITS, MAN’S TRUE DANGER, MEN IN CONFLICT, MEN TODAY, RAGE FOR MEN, REAL MEN, WILDCAT ADVENTURES and WORLD OF MEN. Cover paintings and interior illustrations for such stories were done by many great pulp illustration artists, including Clarence Doore, John Duillo, Norm Eastman, Charles Fracé, Mort Künstler, Bruce Minney, Earl Norem and Walter Popp. Of course, some of these images and stories have a basis in historical fact. For thousands of years, various types of creatures have actually been used as instruments of torture and execution. The ancient Persians used a cringe-inducing method of execution called “scaphism,” in which the victims were both stung to death and eaten alive by various types of insects. In medieval Europe, people were sometimes tortured or executed by being thrown into pits filled with poisonous snakes, wild dogs, wolves or other deadly creatures. According to some historical accounts, Ragnar Lodbrok, the main character of the History Channel’s excellent TV series THE VIKINGS, supposedly died in a snake pit he was thrown into by an English king who was annoyed by Ragnar’s raids on England. In the 1958 film THE VIKINGS, the pit was full of wolves and Ragnar, played by the great Ernest Borgnine, had a glorious manly death scene. Pits filled with poisonous snakes, insects and other nasty critters were also used for torture and execution in India and Eastern Europe. One of the most horrific was the “Black Well” of Bukhara. The local emir populated that pit with venomous assassin bugs and bloodthirsty sheep ticks. They would turn the skin and flesh of the emir’s victims into an agonizing mass of bleeding, festering sores. In Southeast Asia, elephants were trained to execute people in two ways: slowly, by dismembering them, and more rapidly, by crushing them. Rats have also been for torture and execution throughout history in many countries. There were several variations — and certain real life versions seem even worse than the rat-cage-strapped-to-the-face method immortalized by George Orwell’s dystopian novel 1984. In the most gruesome method of rat torture, practiced in both ancient China and medieval Europe, rats covered by a bowl or a floorless metal cage would be placed on the stomach of a bound victim. The cage or bowl was then heated. This caused the desperate rats to try to escape by gnawing their way through the victim’s guts. Nazis used a similar rat torture technique on concentration camp prisoners during World War II. And, during the Korean and Vietnam wars, some American POWs reported being tortured by their Communist captors with rats, insects or snakes. In short, there is indeed a historical basis for some of the torture-by-animal stories and illustrations found in vintage men’s pulp adventure magazine. However, for the publishers of those magazines, the prime directive was not historical accuracy. It was selling magazines. To try to grab eyeballs and quarters at newsstands, men’s pulp magazines went to places where no mags had gone before — leading to (among other things) surreal torture-by-critter scenes that feature scantily-clad damsels being threatened and tormented with animals such as minks, monkeys, squids and iguanas. Some classic examples of over-the-top animal torture cover paintings and illustrations are shown in this post. Others will be featured in the article Wyatt Doyle and I wrote for the mid-summer 2013 issue of HORRORHOUND. 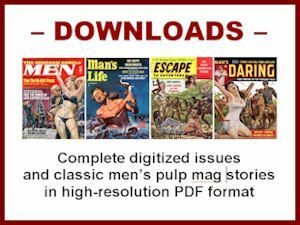 If you ‘d like to read a couple of wild stories from this subgenre in the meantime, click on this link to download a copy of the December 1964 issue of WORLD OF MEN. It includes both a Nazi rat torture yarn (“SOFT FLESH FOR THE NAZI’S FANGED DOOM”) and a tale about an African cult whose leader likes to suspend scantily-clad damsels over a pool full of hungry crocodiles (“HORROR FOR THE DAMNED VIRGINS OF THE DEMON’S LAIR”). That issue also includes some kooky sexposés, like “WIVES GONE WILD— THE SUBURBAN MARTINI SET IN ACTION” and “I AM AN ANGEL OF PASSION: CONFESSIONS OF A PRIVATE DUTY NURSE,” classic "cheesecake" photo spreads featuring Kristine Beben and Nan Harris, a lot of gonzo vintage ads — and other good old pulpy stuff.